(78 words), by Allan Taylor, Hove. Heat waves and wind farms don't mix! Just when power demand surges to drive air-conditioners we get days of stagnant hot air and no wind generated electricity! 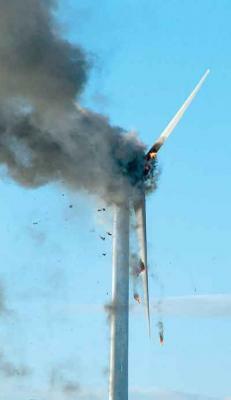 Wind turbines are a serious fire hazard with their contained gallons of inflammable oil. Both wind and solar energy are the worst and most costly ways of generating electricity. Premier Mike Rann, what we want in South Australia is a "weather-proof" , cheap and reliable supply of electricity! Stop your promotion of useless wind farms!